Take care of your skin from day to night with Medipep Basic Essential Kit. With this sensational kit, you'll give your delicate skin the careful attention that it needs. The Medipep Basic Essential Kit provides you with everything the average person needs to keep skin healthy and looking great. 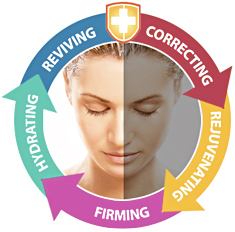 If you don't currently practice a daily skin-care regimen, this is a great place to start. Here's more information on each product in the line, why it's there, and what order to use it in. While a pore’s physical diameter cannot be changed, Pore Reducer helps pores appear smaller - removes excess skin oils, crops out blackheads and smoothes out edges. Pore dilatation begins with faulty exfoliation of cells lining the interior sebaceous gland - cells are too “sticky” leading to microscopic plugs. Once formed, sebum accumulates. Protracted pooling of skin oils serves to both nourish bacteria (like P. acnes and S. epidermis) and ultimately leads to inflammation, and acne formation. Namely, Medipep Pore Cleanser effectively works on both Pore Reducing and Acne Treatment while gently exfoliating the keratinized cells on the skin surface. In details, an enzyme such as papain (papaya) and bromelain (pineapple) in this formula dissolve the build-up of keratinized cells at the skin’s surface. As the first step, Lipoprotein, DNA combined with RNA that is formed from lipase being mixed with papain, (Emmax Peptide) also exfoliates the skin, dissolves the fat glands and reduces the activity of sebaceous gland while working as regulator of hormone activities by increasing T-Cell. Accordingly T-Cell gets turned on against the affected area only in an enlarged pore. As a second step, with more oxygen going into the skin, Lipoprotein fits into a receptor to help clean the skin area and fight bacterial while increasing immune responses without drying out the skin in other area. Meanwhile Salicylic Acid prevents clogging and also helps break down blackheads and whiteheads. This process results in pore reducing. a. T-Zone and U-Zone can be treated simultaneously because T-Cell only affects the infected area that causes large pore sizes. b. The biggest benefit is our pore reducing clear mask does not dry skin out at all but gives non-irritating hydration. Apply to face twice daily. This is a treatment product and should be applied after regular cleanser and before moisturizer and/or sunscreen. Avoid contact with eyes. This pure vitamins and pure botanical extracts contained toner is a gentle yet active and potent formulation designed to achieve maximum skin purification and dirt & oil removal in the face while maintaining natural moisture and balanced skin Ph. The combination of Vitamin C, E and A as antioxidants provides enough hydration on the skin surface while Witch hazel tightens pores without drying. The best result can be expected when used with Pore Reducing Clear Mask. After cleansing, apply a moderate amount to a cotton pad and wipe over entire face. Follow with appropriate facial serum and moisturizer. This skin renewal booster keeps your skin looking fresh, healthy and gradually reduces the appearance of lines and wrinkles. Enriched with natural ingredients like aloe, precious oils, and other active ingredients that include the GC-100 Peptide which clinically proven to reduce the appearance of fine lines and wrinkles up to 57%, this skin balancing lotion delivers essential moisture to the skin's surface. Especially formulated with anti-oxidants and free radical scavengers that work to repair and prevent cellular damage. Medipep Moisturizer will minimized fine lines and wrinkles without the expense or side-effects (such as loss of natural expression) commonly associated with Botox. How does Medipep Moisturizer work on wrinkles? The appearance of wrinkles is diminished as the collagen matrix of the skin increased in absolute amount, to fade liver spots, freckles and uneven skin tone. Several key ingredients in the Medipep Moisturizer, such as the novel peptide GC-100, decrease the concentration of melanin pigment in the superficial layers of the skin. L-ascorbic acid (stabilized Vitamin C), aloe vera, and licorice extract behave synergistically to reduce the appearance of irregular pigmentation. In particular, Medipep Moisturizer inhibits tyrosinase, which is a coenzyme in the enzymatic pathway of melanin synthesis on facial blemishes. Medipep Moisturizer depresses sebaceous gland (oil gland) activity, which results an decreased incidence of facial blemishes. Cleanse skin, then apply this intensely rich moisturizer to face and neck area to deeply hydrate and restore mature skin to a smoother, softer, more youthful appearance. The Hyaluronic Moisturizer for Night Treatment has a light texture and is immediately absorbed into the skin. The cream has been formulated to pamper and protect the skin, leaving it soft and supple. The formulation contains an elastin and collagen producing peptide designed to improve the skin’s elasticity and control moisture loss due to age, weather, and pollutants. 4. Hyaluronic Moisturizer repairs the damage that occurs in aging skin when elastin and collagen experience a loss of water holding proteins. GC-100 aids in visibly repairing and reversing this damage. At night apply a light film of this rich cream over the entire facial area, paying special attention to the areas around the eyes, cheeks and mouth, Gently smooth the skin.